Subscribers of Apple Music may soon get the chance to listen to music through the streaming service via Android Auto, after the discovery that a beta for the Android version of the app enables support for Google's competitor to Apple's CarPlay. The latest beta of Apple Music on Android, version 2.6.0, adds in the Android Auto support for the first time, reports Android Police. Available to those who request access to the beta via Google Groups then downloaded from the Play Store beta page, the beta app offers users Apple Music as one of a number of music sources that can be played through Android Auto. The integration allows for songs in the Apple Music catalog to be played through the vehicle's Android Auto-enabled infotainment unit. Music playback can be controlled through the head unit directly, albeit with actions limited to basic options rather than the full app-based experience. The adoption of Android Auto effectively provides Android smartphone users a way to use the service with their infotainment system in a more interactive way than an auxiliary wired or Bluetooth connection, and to a point brings the app in parity to the experience of iPhone users with a CarPlay-compatible unit. Many infotainment units, including aftermarket options, include support for both Android Auto and CarPlay. 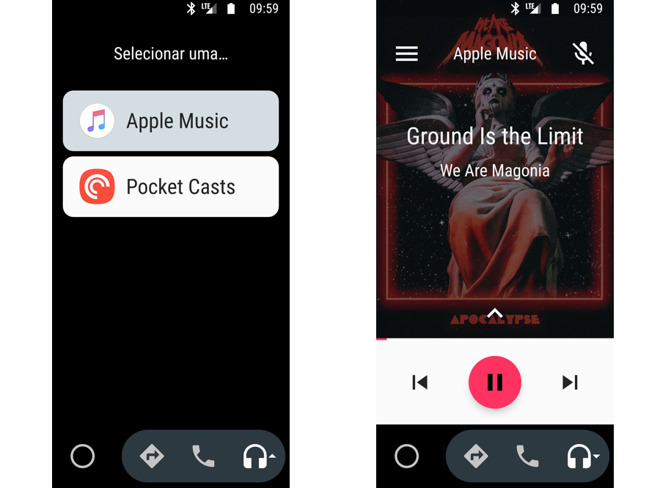 The same beta version also includes a number of other changes that should arrive in the Android version of the Apple Music app, outside of Android Auto support, features that have already surfaced on the iOS version. Search by Lyrics will allow users to find tracks by entering in a few words sung within the track, Artist Pages will provide personalized stations of an artist's music, and Friends Mix will create a playlist of songs played by a user's friends that the service thinks the user will enjoy. While the app is currently in beta, it has also been made available to download through a mirroring service, allowing it to be installed on Android devices without enrolling for testing beforehand. AppleInsider advises caution against downloading and installing software from unofficial sources onto devices, but if users insist, to make backups beforehand.